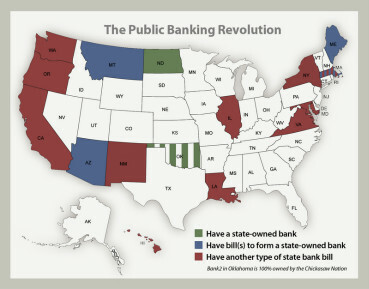 Ellen Brown, author of Web of Debt, helped launch the exciting new state banking effort, The Public Banking Institute. Some are even awakening to the FACT that the Federal Reserve Note is a ‘fiat’ currency, i.e. it is not backed by anything!! And sooner or later ALL fiat currencies collapse. Now, however, Utah has passed a law intended to encourage residents to use gold or silver coins made by the Mint as cash, but with their value based on the weight of the precious metals in them, not the face value — if, that is, they can find a merchant willing to accept the coins on that basis. Dave Gahary interviews SC State Senator Lee Bright (R-Roebuck), who explains why he thinks it’s prudent to study the possible creation of an alternative currency to Federal Reserve notes. Nations (States) MUST print their own money!! This entry was posted in Banking, Government and tagged public banking, state banking, state currencies, state government. Bookmark the permalink.